The digitizer breakout boards arrived, signalling a new round of experimentation with the iPad 3 touch panel. The design of the board seems mostly solid but for a couple of issues. First, as predicted, the edges of the digitizer FFCs need to be trimmed off for them to fit in the connector. This is easily done by pressing down on the FFC on a hard surface with a sturdy sharp knife; the semi-brittle stiffener separates cleanly and without bending the contact portion of the cable. The connectors used on the breakout need the FFC trimmed just shy of the contacts, but this is easy to do. I reflow soldered the board by manually controlling the guts of my toaster-turned-reflow-oven, which worked quite well. I would be cautious to try hand-soldering the tiny connectors as alignment is extremely important, but it might not be a terrible idea, particularly if you don’t have infinite time and patience – I did not have a stencil and individually applying the proper amount of solder paste to each of the 78 miniscule pads took nearly two hours. But the result works beautifully, so I consider it worth the time – plus I got to experiment with a method I’ll need to use a lot when I start building the other boards. Tip: Sharpen a wooden toothpick to use as an applicator. I tried metal points and had a lot of trouble. The completed breakout. This one has the pins set up for breadboard use. 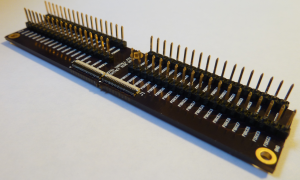 The other issue with the board is that it overhangs four breadboard rows beyond the connection row, so it’s not impossible but certainly difficult to connect to the row of pins toward the FFC connectors. Again though, this is not meant to be an end-all solution, just something to facilitate probing the digitizer until a real board is built, so I’m not too upset about it. Plus the board could not be made much narrower without disrupting the currently-zenlike layout of traces. As I now have a way to get into the connectors, I’ve done some more experimentation with the panel and have come to realize that much of what I thought I knew about the driving of this panel is wrong. I have stared at the pictorial diagram of the concept of mutual pcap for many tens of minutes, but it never clicked until I started playing with the digitizer. The key is this: the capacitance of the display isn’t directly sensed! No relaxation oscillators here, the pictorial says it all – mutual pcap uses your body capacitance to prevent some of the electric field from coupling from the driven lines to the sense lines! It took me an embarrassingly long time to register what is happening here. Using the breakout, it is easy to see how this works. Using a function generator, I drove an 18V square wave into FORCE0 through a resistor (value dependent on frequency used) and connected generator common to the GND pins. Take note, Apple drives the digitizer with approximately 18V in the iPad also. I then connected an oscilloscope to SENSE28 referenced to GND, and grounded SHLD. The result was a mirror of the input signal at an amplitude of approximately 330mV coupled onto the sense line. Then, when the bottom right corner of the digitizer is touched (this is the cross point of FORCE0 and SENSE28), a visible 30mV drop in amplitude shows up on the sensed waveform. 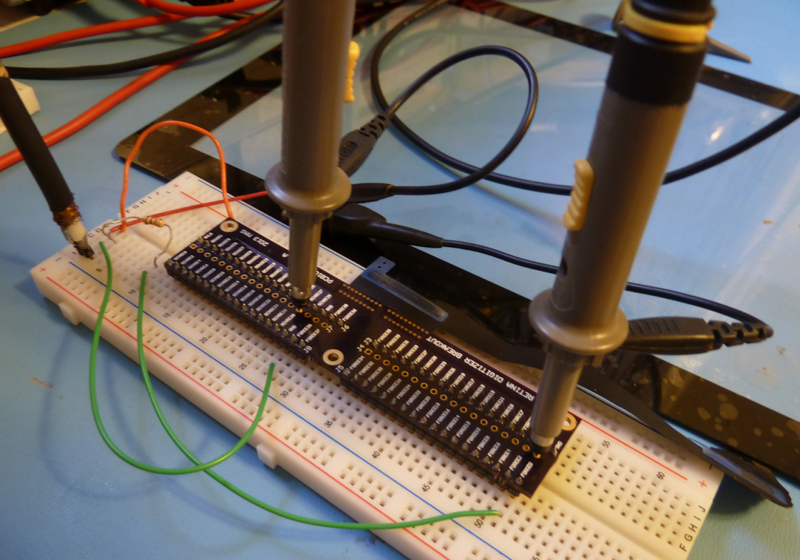 Initial breadboard setup of the digitizer test board. 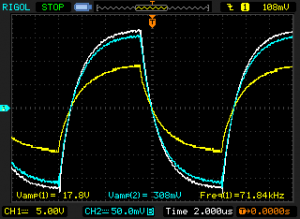 Waveform capture of a 72KHz signal driven through a 10K resistor into FORCE0, coupling into SENSE28. Yellow is source, white is sense without touch, cyan is sense with touch. A clear difference can be seen between touch and no touch. Now, 30mV may not seem like a lot, but against 330mV that’s just over 9%, which should certainly be detectable. In fact, if we fed this signal directly to a 3.3V-referenced 12-bit ADC, this would be around 40 steps of difference, which may be detectable with ample averaging. But we can do better than that. By using op amps to amplify the signal to the 3.3V range (and to DC bias it up above ground for better compatibility with ADCs), we should have plenty of dynamic range to sense touches. This is where I hit a snag. I figure that for 40 force lines and 30 sense lines, and desiring a refresh rate equal to the LCD itself (60Hz) to prevent sluggishness, a touch scan rate of 40*30*60=72KHz is the minimum necessary. If averaging is desired for better accuracy, then scan rate will need to be a multiple of this. However, I only had general purpose op amps on hand, with slew rates in the 0.5V/us range. In the 70+KHz range, square wave edges over a 0.5V/us slew rate device are just too slow compared to the small differences we are looking for. I will need to source some higher-speed op amps before I can really try this out. But until that happens, here is my plan for interfacing the digitizer. I will use some programmable logic or a few 4:16 decoders to drive an array of transistors connected to the force lines, which will generate a pulse on each line in turn. An analog mux will pipe all 30 sense channels into a high-speed op amp and then into a megafast ADC which will continuously scan until a certain voltage level has been reached. 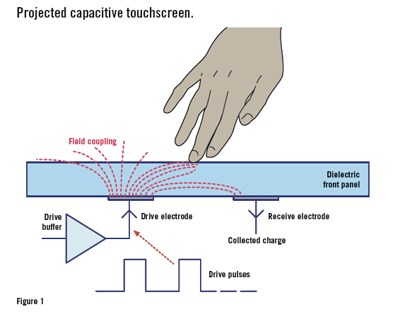 If the pulse generation time and the minimum level received time are a known distance apart, it should be trivial to determine whether the screen is being touched in this area – the longer it takes to reach the desired voltage, the more charge is being diverted into the attached capacitive body (e.g. finger). An array of op amps and a couple of multichannel ADCs could be used in place of the multiplexer as well if that ends up being less expensive or more accurate. 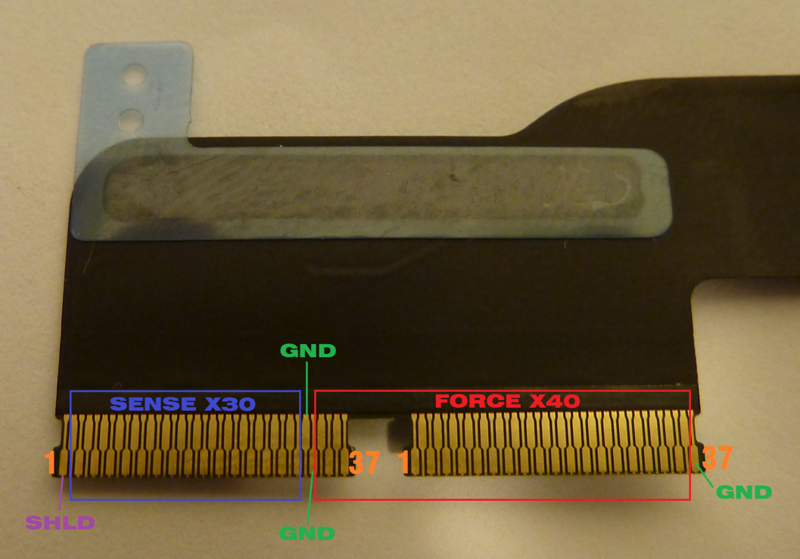 Now awaits another trip to Digikey and some more research, but this is starting to look more and more feasible. This entry was posted in Electronics on 2013-05-27 by mike. After the longest 15 days ever, this board is finally at the fabricator. 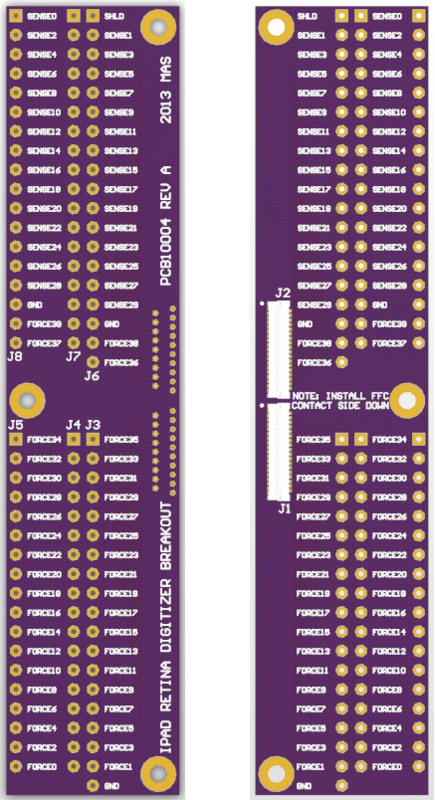 It is missing the USB crystal and I have changed the pinout of the button and LED board connector, but this revision is what it is and will at least be good for troubleshooting. Parts are mostly on order. These boards finally arrived, and what do you know, they’re just too small to use comfortably. I have redone the board, replacing the switches for larger ones and the LED for a slightly larger common-anode unit to trim cost and aid availability. 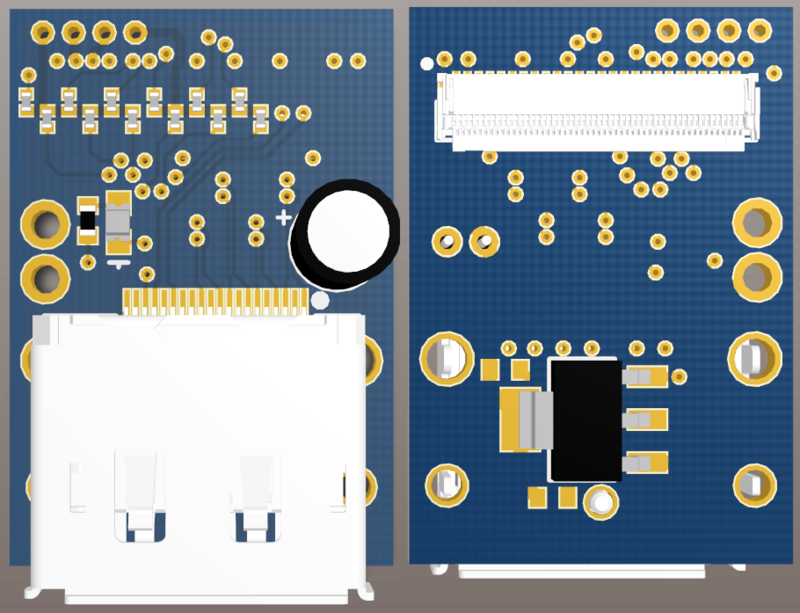 The new board is 60% taller and the exposed area is slightly wider to accommodate the larger switches, but the board area is fairly comparable so the cost is similar. I will write a full post and release the documents on the new board sometime soon. Also has made it to the fabricator. Parts are also on order. This is likely to be the first board that gets built, as it will allow me to test out the panel. Keep an eye out. I have installed the insulation and the air exit port. The insulation makes a dramatic difference in the speed at which the chamber heats and cools (it heats to 260C a full minute ahead of the noninsulated chamber, and cools much more slowly). I am still contemplating how to install the air intakes and diffusers, so that’s the major mechanical holdup at this point. 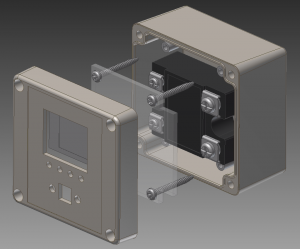 Electrically, I am awaiting parts in order to model them for PCB footprints, but at least some of what I’ll need (such as the enclosure) are on order. SSR is in house now, as are the thermocouples; thermocouple interface ICs are on order. Boards are at the fabricator, parts are on order. Should be in on Monday. Maybe these will be the first ones to be built up. Research progress on the digitizer is halted pending the build of the boards. Sure seems like I have a lot of things going on right now, mostly waiting on fabricators. I could use a faster board house than OSH Park… but it’s hard to beat the price. How can anyone be making money when I get three boards shipped to my house for $2.50? This entry was posted in Uncategorized on 2013-05-16 by mike. After discussion with commenter Eva in the last part of this series, i was motivated to make some progress on the investigation of the iPad 3 digitizer. Based on leaked schematics for the iPad mainboard assembly and on the physical digitizer itself, I have mapped the physical pins on the digitizer FFC to functions. There are 40 excitation pins, 30 sense pins, three grounds and a SHLD pin of which I have not yet determined a function. Normally SHLD means shield, but it’s being fed into a processor input so that doesn’t make sense. I will continue to investigate. Layout of the pins on the iPad 3 digitizer. The leaked documents also indicate that the proper mate to these are Molex 502250 series connectors, the same series as the one used on my DisplayPort boards for the eDP tail. But contrary to the 51-pin version, this one is not so easy to get ahold of. As I noted in the previous post on the digitizer, the 503566-3700 is a close alternative, but it looks as if these FFCs are just too wide (11.7mm) to fit in them (11.4 +/-0.05mm max). 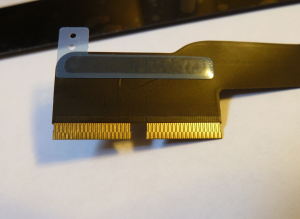 There are not a lot of alternatives though, so if worse comes to worst I may end up trimming the FFC to fit – as you can make out in the above photo, there is a small amount of tab with no contact at each edge, and without this the connector easily comes in at under 11.4mm. Also of note, the distance from the edge of one connector to the edge of the other is 13.5mm. I have done all I can do with the digitizer by inspection alone, and at this point can only advance with it electrically. To aid in this I have drawn up a simple breakout for the digitizer. As I was not sure what my end application would be, I included provisions for connection either to a breadboard directly or to another board via inexpensive 40-pin IDE cables. The FFC connectors are on the bottom of the board, since the contacts of the digitizer face up when the tail is unfolded and the connector chosen has only bottom contacts (the 502250 series has contacts on both top and bottom). Not ideal, but workable for the short-term use that this board is designed for. A simple breakout for the iPad 3 digitizer. Each position is labelled on both sides with its function to the best of my knowledge. Dimensions of the board are 0.9″ by 4.1″. Production of this (2-layer) board at OSH Park costs $18.50 for three pieces. 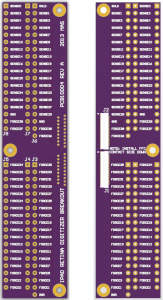 Populate J3 thru J8 with 0.1″ snappable header strips – omit J4 and J7 for breadboard use, and omit J5 and J8 for IDE cable use. The mount pads are sized for 2-56 screws. So then, now that we can connect to the panel, how do we read touches? That part isn’t quite so simple. If the documentation from the iPad mainboard is to be trusted, 40 independent outputs are generated and sent to the panel in sequence to 40 horizontal electrodes, and 30 vertical electrodes pick up the signal when coupled into them by a conductive mass (e.g. finger) on the surface. In the first part of this series I counted 41 squiggly horizontal lines and presumed these to be the electrodes, but it turns out that the sensitive area is between the squiggles, resulting in 40 driven rows. The methods for driving and sensing touch position are a hot area of development in industry at the moment, and the big companies are all hush-hush on their analog frontend design. But we know generically how Pcap touch should work, and we can take a guess from this and by examining how Pcap is implemented in devices. For instance, we know that Apple uses three main ICs to drive the touchscreen – a driver to generate the output to the panel, a receiver of the signals produced by the panel which incorporates an analog-to-digital converter, and a processor to interpret the ADC data. One popular method of Pcap sensing is to use the changing capacitance to shift the frequency of a relaxation oscillator, then use a frequency to voltage converter and finally an ADC to sense this capacitance. Given the structure of the panel and supporting circuitry, it seems reasonable for the panel to be read in this way. A couple of links that provide information on mutual Pcap: http://ww1.microchip.com/downloads/en/DeviceDoc/93064A.pdf, http://www.walkermobile.com/SID_2012_Short_Course_S3.pdf. I believe it is unlikely that a hobbyist would be able to get ahold of the particular solution used in the iPad – in fact, as at least the receive and processing ICs are made by Broadcom, I’m positive it is impossible – and it is almost as unlikely that there will be an off-the-shelf controller with the proper number of channels that a hobbyist can buy in reasonable quantities. I therefore plan to implement a solution using generic hardware – simple programmable logic and/or MCUs. This way cost and minimum buys aren’t problematic. But that architecture is a topic for a later post, this one has gone on long enough. This entry was posted in Electronics on 2013-05-08 by mike. I don’t have enough content for a full post today, but here’s the state of things. I discovered that I made a dumb mistake and left out the oscillator for the USB controller in the MCU. 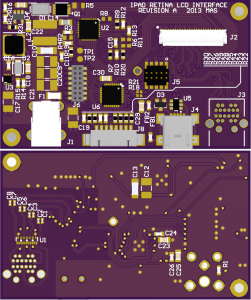 The oscillator takes a good amount of floor space and the board is already packed, so a fairly serious redesign of that section of the board might be in order. Thankfully I’m only out $40 and not the $couple hundred I would be at a traditional board house. I’ll still use the existing boards to work out the kinks on the power switching and backlight sections and to develop the non-USB functions of the MCU. Actually, so long as you aren’t using USB, the boards should still be perfectly workable. Nonetheless, documents will be held back until this is resolved. Probably too small, but I want to see how too small before I remake it. Boards on order. Documents released, but you probably don’t want them yet. Out for manufacture, documents released. Go nuts, but do realize that I haven’t tested this design in the slightest yet. There is also a new project on the horizon which will get its own post as soon as I can talk enough about it to do so. It will be impossible to hand-solder these boards what with my love of QFN and related no-leaded parts and things with thermal slugs. The company where I work has a nice 6-stage production-class IR reflow oven, but I’d rather not have to ask them to fire the thing up to do one tiny board. 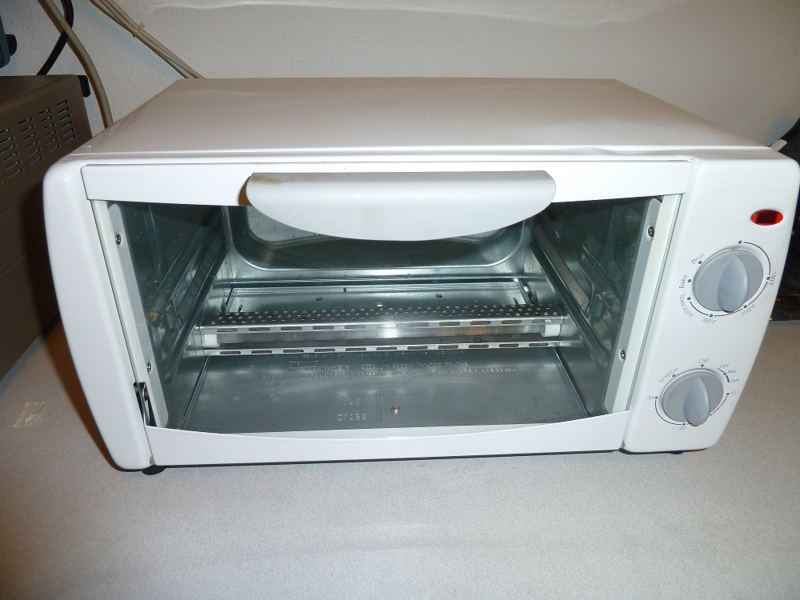 For a few years now I’ve been contemplating building a desktop reflow oven for my personal projects, and this seems like it might be the perfect opportunity. I have been gathering materials for a while and now am at a stage to put a design. Keep an eye out for that in the coming days. This entry was posted in Uncategorized on 2013-05-07 by mike. 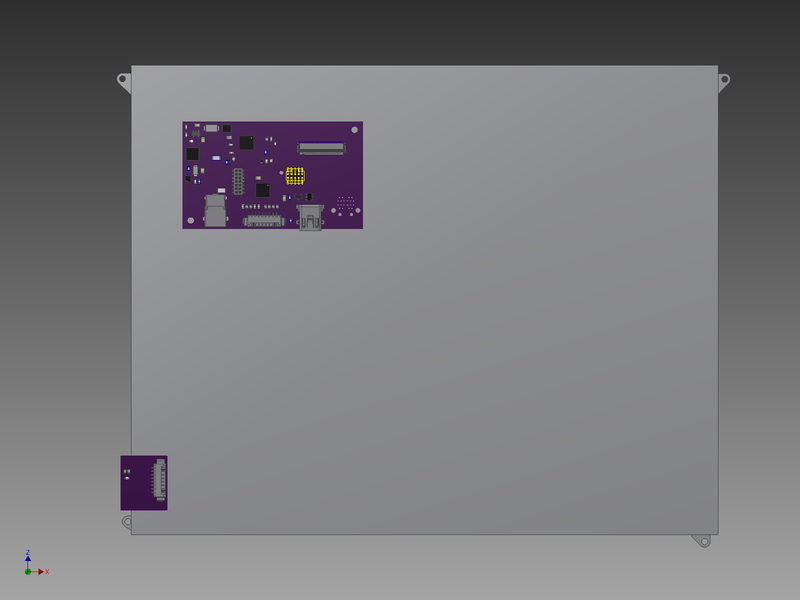 Now that the main board has been put on order, my focus can shift to the ancillary parts of the project. In particular, it is time to consider the human-interaction part of this build. I think it is important to be able to control the brightness, as well as overall system power, of the panel. Some designs handle brightness via the USB HID monitor class, and I may well go this way eventually, but for the short term I would rather have simple up/down/off button control, so I can have immediate gratification before I spend the time to write the HID software. Most monitors have some controls in the lower righthand corner – power, up/down, menu, etc – as well as a status LED. As I will not be inserting video data and thus will not have an OSD, some of these buttons are not important. 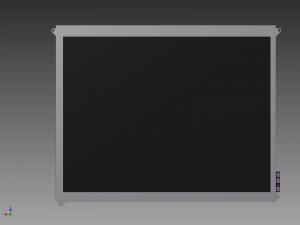 But I think the lower-righthand corner is natural for monitor controls, so my plans call for a simple board adhered to the back of the panel at this point, with basic controls and a status indicator LED. This will connect to J8 on the main board, which has been wired for this purpose (three active-low button inputs pulled high, and three resistor-limited PWM outputs). I have chosen to use a RGB LED because I have not yet decided on indicator colors. Perhaps white would have been ideal for this application as it is an Apple panel, but I couldn’t find a white + orange (for standby) LED. I chose a 0604-size 6-pin LED (Rohm SMLP36RGB1W3), so I could fit discrete white and orange 0402 LEDs if I wanted to change to that. For buttons, I was really torn. On one hand, it would have been nice to have the whole board hidden from view, and use right-angle buttons just exposed beyond the edge. I couldn’t think of a good way to show the LED though. I thought about capacitive touch buttons, which would be neat and fit with the Apple theme of the unit, and I actually wired the button inputs to capacitive touch inputs just in case, but I didn’t want to bother with the software and debugging right off the bat. So I went with regular SMD microminiature tactile switches (C&K KMR421G LFS). These are seriously, seriously small buttons. They should end up no taller than the panel is thick (and if you have a panel, you know how crazy thin it is), and allow my exposed board area to shrink to 0.14″. So enough talking about it, let’s have a look, eh? First go at the iPad LCD controller interface board. It’s smaller than it looks. You’ll notice a couple of things about the design. First, note that there are no traces or copper features on the left section of the top of the board. I plan to adhere this board directly to the back of the panel, so I made sure there was no copper (even under soldermask) that could be rubbed through and short on the back of the panel. Mind you, this circuit was designed with short circuits in mind, and nothing will be damaged, but if it shorts it won’t work right and I’ll be peeved. I think I will use contact cement to adhere this board rather than the foam tape of the other one, as it is designed for flat contact and has no components or pins like the other board does. You’ll also note that the bottom side traces extend straight for a quarter inch from where they are routed to the connector. I actually made this board larger than it had to be, because I didn’t think I could get good adhesion in only a quarter-inch of mating surface. I kept the traces straight in this area so I could easily make the board wider or narrower as needed. The total board dimensions are now 0.65 by 0.76 inches, driven in X by adhesion area and in Y by the components themselves. This board is 2-layer and should be very inexpensive (at $5 per square inch, my math works out to $2.47 per 3 – I wonder if OSH Park has a minimum order? ), so I plan to order it and just see how it works without putting too much more thought into it. I spent a little bit of time deciding whether this will end up too small, and in doing so drew up a quick model of the boards in place on the LCD. Decide for yourself if I’m crazy. I don’t have the FFC modeled in yet, but assume it would naturally plug into the connector in its current position. I also haven’t bothered to model any structural components, which I also haven’t mentioned yet. In lieu of a full case, I think I’ll do a minimal support structure out of 1/8″ aluminum bar stock – a strip down each side to catch the mount pads, one across the back and a hinge with a foot so it sits upright on a desk. I’ll talk more on that when I get that far. In the process of generating these prints I did a little more measurement and I think these will be way, way too small. But what the hell, they’re cheap, so I ordered them anyway. You may want to wait for Rev B. This entry was posted in Electronics on 2013-05-04 by mike. Much has happened since the last update. I have received a panel, as well as the balance of the components that I ordered. The panel has a half-inch scratch on the front, so hopefully it is still functional. The design has been steadily progressing. The architecture of the board is now a bit more complex – a Freescale Kinetis-L2 (ARM Cortex-M0+) processor is onboard, primarily because it was cheaper than the competing TI MSP430 that I had planned on using, go figure. To accompany this, a Mini-USB header has been added. This will not power the system as per other folks’ designs because I refuse to violate the USB spec (and my motherboard) that badly, but it will allow for connectivity to the host in order to (hopefully) enable control of the panel from keyboard hotkeys. A Linear Technology LT3502 switching regulator has been added to provide 3.3V for the panel and the processor, and a Skyworks AAT4618 high-side switch was put in place to allow power to the panel to be disabled when the system is inactive for greater power efficiency. The board should operate from something like 8 to 40V DC, for whatever power adapter you happen to have around that fits. First run of the full-function interface board, revision A. I was too lazy to add some of the 3D models. For a sense of scale, the corner pads are sized for a 2-56 screw. So there it is. The board is now fully routed and has been sent out for manufacture. Naturally this means I’ve started noticing errors in it, but I’ve not found anything that means it altogether won’t work. Getting matched trace lengths on the mDP lines took a couple hours, and was probably the one most time consuming part of the design, but now all 8 lines are matched to within 10 mils. This is probably excessively close, but what the hell – as long as we’re doing it, may as well do it right. The final dimensions of the board ended up at 2.525 by 1.5 inches – quite a bit smaller than I originally planned on. And it is dense. We’ll see how well everything works. (2013-05-07) I will not be releasing documents for this board for a while as I have noted a serious flaw in the processor section. I will use these for debugging the power system then respin the board when I am satisfied. This entry was posted in Electronics on 2013-05-03 by mike. In the comments for Part 2 of the main series, the desire for a comparatively simple interface board was noted. From the comments in the original thread and from the Hackaday writeup, a number of people have expressed interest in using the panel as a projector, ala the now defunct LumenLab plans. Compared to my plans for the full-fledged panel interface, this application is a whole lot simpler. A large external light source serves as the backlight, so no backlight driver is necessary. With no backlight, there is no need for generation of voltage rails onboard as the whole unit can be run off a 3.3V input. And presumably power and brightness control can be handled externally, so no processor is needed onboard. 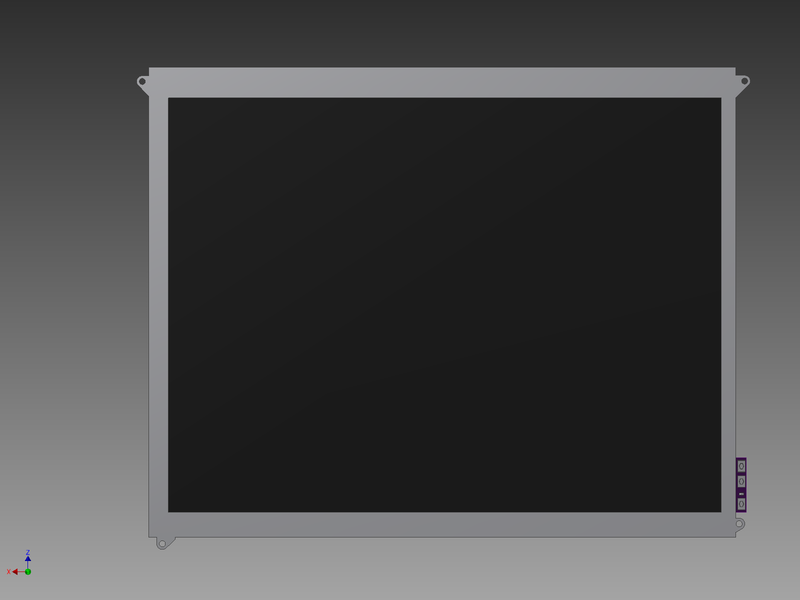 I had a couple hours free, so I took a swing at generating a board for the DIY projector crowd. At the suggestion of commenter Joe (and as an exercise to see whether it made the routing any simpler), I this time used a full size DisplayPort connector. This made the fanout a lot simpler than the mDP I am using on the full-function board, at the expense of some real estate. But the design remains fairly compact. It is worth noting that DisplayPort’s pin ordering is different from the iPad FFC. This means that they cannot be simply wired straight through, and must be routed between layers. The least troublesome way to do this was to place the FFC on the opposite side of the board to the DP connector – this wouldn’t be ideal for my main controller board, but works here as the tail of the LCD will be held away from the back of the panel anyway. Top and bottom of a simple DP to iPad FFC adapter. This image does not show the final silkscreen. Not much magic going on here. The data lines are straight passthrough from DP to FFC. The twelve backlight cathodes are connected in two banks of six and brought out to pads, on the off chance that this board might be used with the backlight intact. To facilitate proper backlight driving, individual 0402 resistors are placed on each of the twelve strings. Power is diode-ORed between the DisplayPort connector and pads for an external 3.3V adapter, to allow powering from either source without backfeeding to the other; 0603 bypass pads are provided in the event that the diode is not desired or required. A 5mm electrolytic capacitor is on the output of the diode to stiffen the sources during current peaks. Finally, a LED indicates the presence of power from either source. The whole unit comes in at 0.810″x1.175″, barely larger than the DP in width. 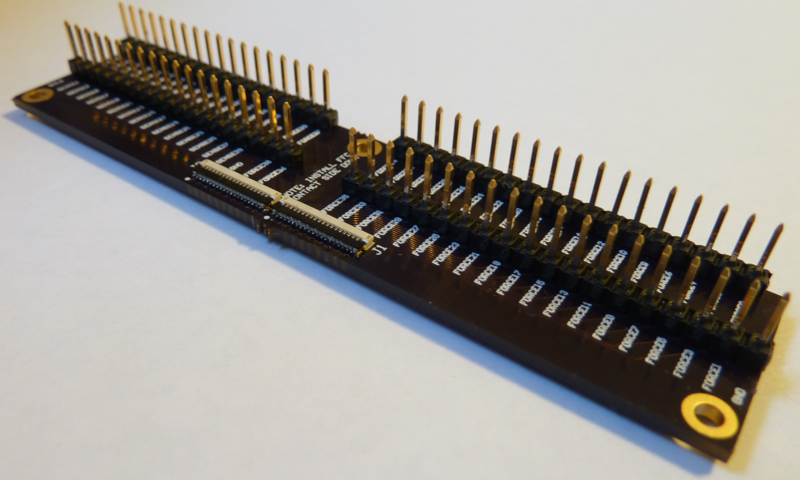 I plan to order one set of these to test and debug in the short term, but beyond that would be more than happy to work with anyone else who might want one. 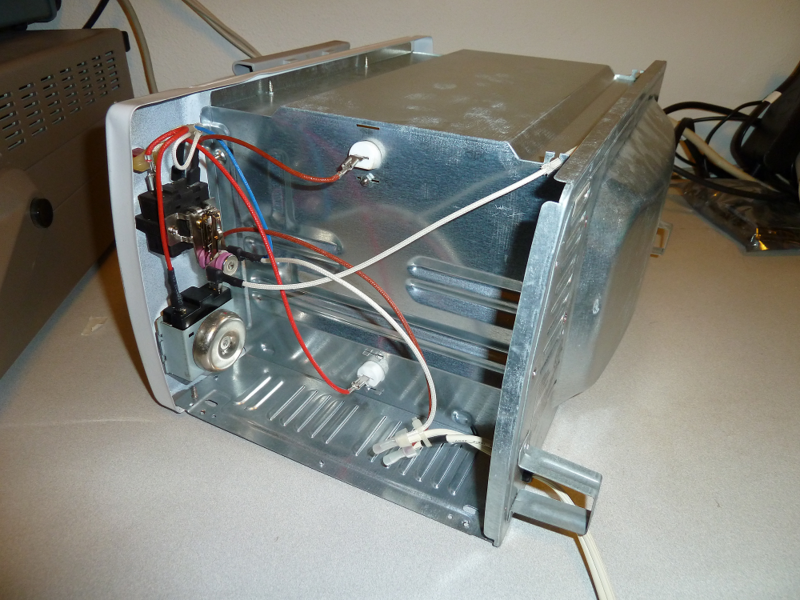 This entry was posted in Electronics on 2013-05-02 by mike.